Norwood Sawmills was founded in Canada in 1992 by Peter Dale who wanted to build his own home. The cost of timber was sky-high. He looked at buying a portable sawmill, but found that they too were priced out of reach. He designed and built his own sawmill – one that was strong, accurate, reliable and affordable. Bringing these qualities together in one sawmill was uncharted territory. According to Norwood president, Ashlynne Dale, “Norwood has invested millions of dollars in advancing portable sawmill innovation and technology and has accumulated nearly 50 patents. In fact, Norwood has more patents than all theNorwood Sawmill other sawmill companies around the world combined. All that Norwood ingenuity translates into portable sawmills that deliver maximum productivity, maximum strength, maximum efficiency and maximum versatility. Norwood designs and builds portable bandmills and chainsaw sawmills for part-time or full-time production of lumber from softwood or hardwood logs up to 90 cm in diameter. Lumber can be any length thanks to the availability of unlimited track extensions. Many Norwood owners are milling logs into beams and lumber 15 metres and longer. Compared to circular mills, the thin band saw blades are the most efficient way to convert logs into timber. Less than half the thickness of conventional circle saw blades, they typically yield 15% more solid lumber. This adds up quickly to profits when cutting valuable hardwoods. Band blades also produce less sawdust to dispose of and require less engine power. Overall, maintenance requirements for Norwood bandmills are exceptionally simple, contributing to higher production output. Norwood offers both manual and hydraulic band sawmills. Manual sawmills provide power only to the blade, which means the sawyer (and assistant, if available) loads and turns the logs, sets the board thickness, and feeds the blade through the log by hand. While this requires some physical exertion, experienced sawyers learn to minimise the effort, using a cant hook and, on larger logs, a winch.The advantage of the manual mill lies in its low cost and simplicity; with only a few moving parts, it is easy to maintain and repair, even in very remote places. Hydraulic portable sawmills use the engine to provide the muscle for all the log handling with the push of a lever. The higher cost and maintenance are offset by higher production with less effort. Norwood’s band sawmills are ideal for a range of customers, from the part-time sawyer such as hobbyists, farmers or woodworkers, to full-time commercial milling operations. The LumberMate LM29 can handle logs up to 72 cm in diameter, while the LumberPro HD36 is built to tackle logs up to 90 cm in diameter and mill boards and beams 70 cm wide. 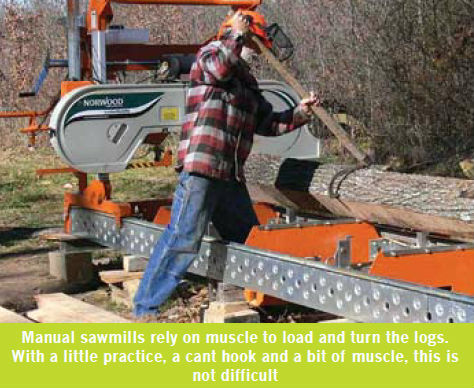 Norwood sawmills are so easy to use that even first-time sawyers get to milling like seasoned pros in no time. And, because they are packaged and shipped in kit-form, you can get your hands on a Norwood sawmill for a lot less than you would think. Norwood economically ships sawmills worldwide. Freight costs are extremely low thanks to their compact kitted packaging; an entire sawmill can fit on a single pallet. Norwood sawmills are milling lumber literally all over the world, including throughout Africa. Because they are so reliable, they require very little service and very few replacement parts. This means that Norwood owners, even in the most remote locations, can be self-sufficient. “Sawyers are typically a resourceful, down-to-earth, hard-working group of people. They have a job to do and want to get on with it,” concludes Dale, “They want a sawmill that they can afford, and that will be productive, accurate and reliable. Norwood sawmills are built to meet those expectations.